Changing strings and keeping them in tune can be a pain, but a guitarist's life is made easier with locking tuners. Locking tuners keep their intonation, even when the guitarist uses a tremolo (“whammy”) bar. 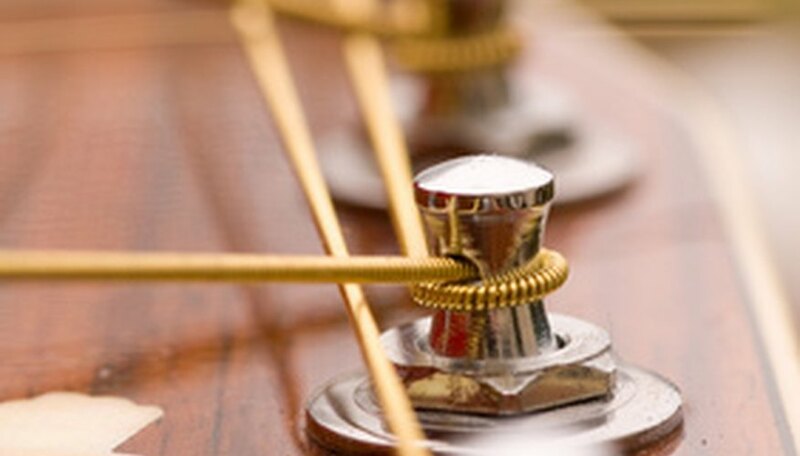 By automatically securing each string against the string post, they eliminate the hassle of winding the string precariously around the tuning peg. Grover locking tuners go one step further, eliminating thumb screws found on other locking tuners. Performers who have to quickly change strings in the middle of a show will find these especially helpful. Rotate the tip of the low E string’s tuning peg until it clicks into place. Turn the tuning key until the tuning peg’s string hole is positioned away from the tuning key. Slide the new low E string through the corresponding hole in the bridge, which is located at the bottom end of the instrument. Pull it all the way through, until the ball of metal at the end of the string catches against the bridge. Thread the string through the tuning peg’s string hole. Pull firmly. Hold the string taut, making sure that it is lying in the corresponding groove of the nut. With your other hand, turn the tuning key as if tuning the instrument. The tuner will automatically lock the string in place. Continue using the tuning key to tune the string. Match its pitch to a chromatic tuner or in-tune instrument for best results. Repeat for all six strings. Make sure to install strings with gauges (diameter sizes) that fit your needs. Smaller gauges are lighter, good for soloing and effects like pull-offs or bends. Bigger gauges are heavier and stiffer. They require more force to play, but in the right hands deliver a fuller, brighter sound.